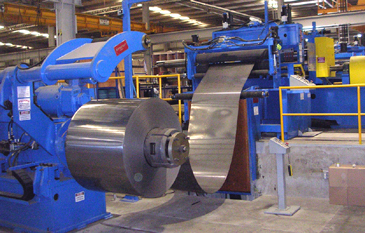 Tijuana, Mexico - JFE Shoji Steel de Mexico, a flat rolled steel distributor and coil processor, has installed a compact heavy-duty Braner/Loopco Double-Loop Turret Head™ Coil Slitting Line in its Tijuana Mexico coil processing facility. The new Slitting Line is capable of processing 20-ton x 1524mm (60") wide high-strength hot rolled pickled as well as surface critical cold rolled bare and coated carbon steel coil in gauges from 0.35mm (.014") through 3.20mm (.126") at line speeds to 304 meters/minute (1,000 FPM). The Slitting Line has the ability to process high-strength steels with yield strength up to 66 Kg/mm² (93,000 PSI) in all gauges. 20-Ton x 1524mm Double-Loop Turret Head™ Slitting Line processes hi-strength surface critical coil. Compact Hi-Pass Line: The JFE Slitting Line is an example of Braner/Loopco's "compact hi-pass line" design that conserves floor space, reduces manpower, threads quickly, and improves coil tracking. Despite being a "Double Loop" Slitting Line, the system is less than 50' from end to end. The compact foot print places all system elements as well as the entry and exit end coils clearly within the operator's sight line, which results in improved safety and makes TV cameras and monitors unnecessary. "Hi-Pass Line" locates the strip-processing equipment above the coil OD, which speeds high-strength coil thread-up and elminates "reverse strip bending" as the strip is threaded and processed. Hi-pass line benefits include fast coil threading, elimination of equipment-induced coil-breaks, elimination of strip surface scuffing from entry and exit pass line rolls, produces straight sidewall slit coils, and offers exceptional productivity. Driven Loop-Control Uncoiler allows "tension-free" slitting for improved thin-gauge surface-critical coil quality. 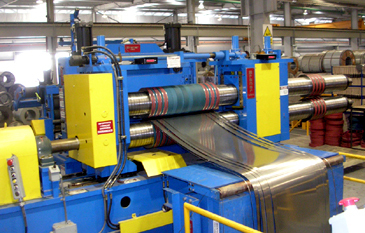 Single & Double-Loop Operation: The JFE Slitting Line can process coils in 3-operating modes: Tight-Line mode is used for processing heavier gauge and side trimming coils; Single-Loop mode is used for slitting medium-gauge non-critical surface coil; and Double-Loop mode is used for slitting thin-gauge surface critical coil. In the Double-Loop mode, the Uncoiler, rather than generating back tension, drives the strip into a free-loop ahead of the Slitter allowing zero back-tension slitting. Driving the strip into a free-loop ahead of the Slitter for zero back tension slitting reduces side trim requirements, generates tighter slit width tolerances, and eliminates strip surface defects caused by slitter tooling slippage and scuffing. Turret Head Slitter™: A 9" arbor x 150 HP 2-head quick-change Turret Head™ Slitter produces precise width tolerance slit strips with minimum burr throughout the entire range of gauges and mechanical properties. Turret Head™ arbors are supported in precision machine tool quality bearings mounted in massive one-piece stress-relieved and 6-side precision ground solid steel housings that weigh nearly one-ton each. The rotatable Turret housing is supported on a 300,000# capacity anti-friction bearing, and the hydraulic cylinder positioned outboard arbor bearing housing is mounted on zero-maintenance anti-friction precision machine tool slides. Huge aluminum-bronze gibs contain the vertically adjustable upper arbor bearing boxes and allow for "zero" axial arbor movement. Large one-piece upper arbor bearing boxes are positioned by motorized anti-backlash screw jacks equipped with electronic encoder digital position readouts for quick and accurate positioning. The Turret Head™ Slitter design is more rigid and precise than any other Slitter design, and because the arbors are easily accessed with no obstructions re-tooling and head changes are accomplished faster than with any other slitter design. Completely exposed and accessible arbors re-tool quickly. No frames or bases obstruct the removal or installation of the slitter tooling. Heads are exchanged in less than two minutes. 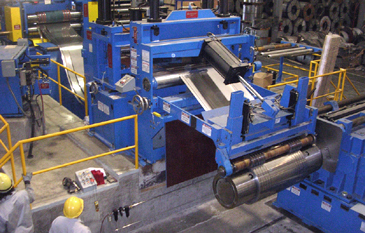 Unique Strip Tensioning: The JFE Slitting Line is equipped with two (2) Tensioners - a Pad Tensioner for processing HR pickled and cold rolled coil, and an "Acu-Trak" Tensioner for processing surface critical coil. The Pad Tensioner employs fabric covered quick-change "pads" pressed together by multiple pneumatic cylinders to generate rewind tension. The Pad Tensioner is utilized for processing non-critical materials. The entry strip separator is a lightweight aluminum alloy arbor that can be exchanged with pre-tooled arbors in 60-seconds. The "Acu-Trak" Tensioner employs a series of upper and lower tension belts to generate rewind tension. The Acu-Trak belts make a large surface contact area, which allows high friction and high tension to be generated with minimal "squeeze" force. Rewind tension is controlled from the main operator console.